Tangled Up In Writing: NEW RELEASE: Healer's Bane by Hope Ann! 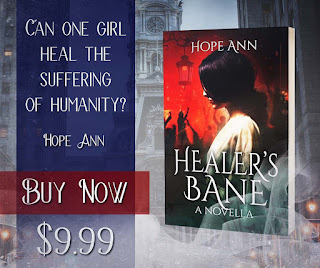 Another awesome book by author Hope Ann -and- it's available in paperback too: Healer's Bane! It's already the #1 new release for Christian Fantasy on Amazon, so if that isn't a sign to go check it out, I don't know what is! Kynet never planned to be at the forefront of the rebellion. That was her brother’s hobby: rallying the people. Plotting against the leaders. Running into dangers she’d have to negotiate him out of. That was before the Poisoner tried to kill her. Left with strange powers in the aftermath of his attack, Kynet is even more convinced the rebellion isn’t worth it. For every life her healing saves, ten more are wasted. But her quest to stop the carnage before war breaks out will bring her face to face with the man who tried to murder her... and with her own helplessness against a grim reality she may not be able to change.